Conquer the highest peak in each province in one weekend to raise awareness and much needed funds for SERVE’s development projects. A team of five people is required for a complete registration (four climbers and one driver). This event is aimed at people of moderate fitness level. Prior hill walking or hiking experience is not essential. Some training will need to be undertaken in preparation for the event. You must be at least 18 years of age to participate in this event. The fundraising target is €2500 (£2000) per team (Teams of 5). 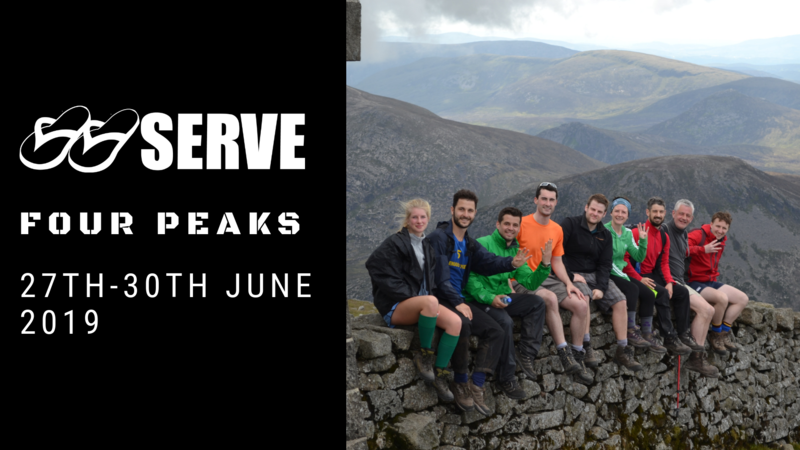 SERVE 4 peaks challenge pack – everything you need to know to get you peak-ready. Click on the blue “Register Now” button. Input your details on the page, along with the names and contact details of your team members. Only one team member needs to register your team. Please provide all team members email addresses. A member of the SERVE team will be in contact with you to confirm detail. What’s it all about? The 4 peaks challenge is a great way to spend a fun weekend outdoors with your friends or colleagues while raising much needed funds for a worthy cause. Can anyone participate? All participants must be aged 18 years and over. All participants must be in good health and have a reasonable fitness level. Your SERVE fundraising team is here to help you reach your target by providing support and advice. This will include online fundraising tools, sponsor cards, t-shirts and other resources.